We’ve spent the last two weeks traveling out west and back again. Our trip started with driving to St. Louis to drop Sammy-do off at my Mom’s for a little paw sitting. Sam loves going to his grandma’s because the food scoop overflows, the squirrels are plentiful in a fenced in back yard and the cute factor gains a little extra loving. We hate traveling without him, but it’s comforting to know he is being super spoiled while we are gone. While we were in St. Louis Jeff and I decided to try something new. We took a running tour of downtown. After 3 hours and 6 miles I learned things about St. Louis that I never knew. 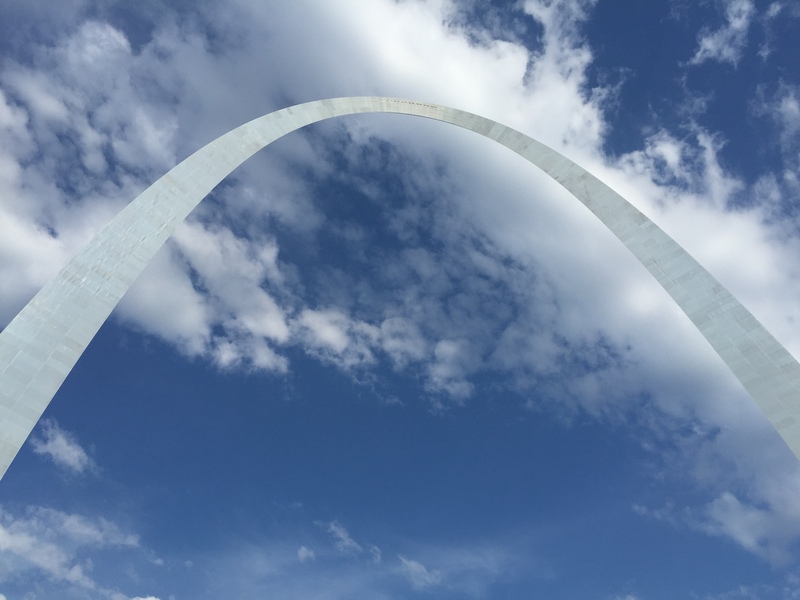 We went with St. Louis Running Tour, THE ONLY running tour in St. Louis. Our tour guide Joe showed us iconic buildings like Union Station, The Arch and Cardinal Stadium. Joe also gave the behind the scenes facts and sometimes seedy drama that unfolds during the development of the new frontier. It is a run and it is a tour so there are lots of stops to talk with bursts of running to the next destination. Our longest stretch of running was no more that ¼ mile, so if you do this thinking you are going to get your 4-6 mile solid run in, you won’t. We didn’t take the tour for the run, but to learn & see more about the city that I grew up around…while getting a little low-key exercise. Definitely a very fun morning with Joe! That afternoon we flew off to Las Vegas for the National Hardware Show. 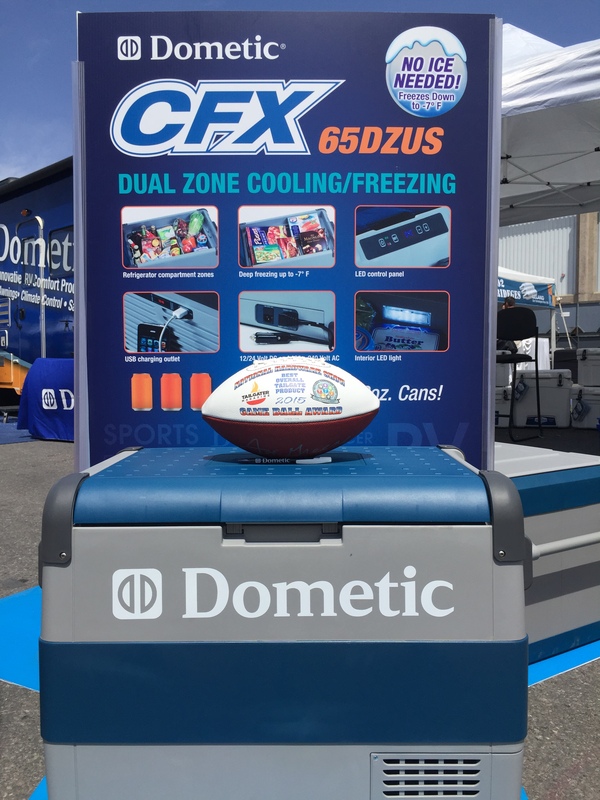 Dometic had a huge display of their new portable refrigerator/freezers (CFX) that run off of 12V, 24V or 120 and their super insulated coolers. They are great for tailgating, RV’ing and boating. We have a CFX frig/freezer that is the best! You can set it to freeze or refrigerate anywhere from 50 degrees down to -8 degrees. That’s a lot of frozen solid ice cream…on 12volts of power no less! It makes up for the small refrigerators that RV’s typically have. Las Vegas is an interesting town and one that neither of us is particularly comfortable in. I recharge in tranquility and nature. So when you go out for a run at 5AM and the street department is already at work with jack hammers and the all night partiers are just reaching their peak volume, my soul is just piled on with more noise that I went out to decompress from. Throw in a couple of propositions from some ladies of the night (Jeff) and we were ready to get rolling. Early morning Las Vegas run…bright and loud! 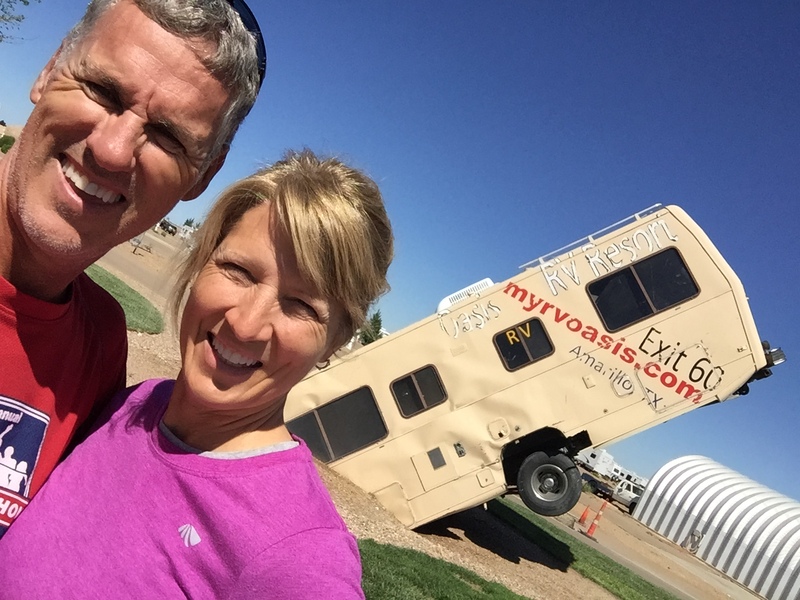 From Las Vegas we drove the Dometic RV back to Elkhart Indiana. We were going to hit the central, most direct route through Colorado, but with forecasted snow in the mountains we redirected to the southern route. Our first stop was in Flagstaff where we drove though sleet, snow and rain. Saturday morning we woke to 1” of snow. The sun popped out and we decided to wash the Vegas grime off our running shoes with a trail run before hitting the road. We stayed at the Flagstaff KOA and they have access to trails right out the back gate. It was a stunning 5-mile run as the sun filtered through the snow-covered foliage. Now this is what I’m talking about! Running through the woods fully alive…nothing is better for the soul. I love this KOA for its convenience to town, trails right out back and very little road noise. 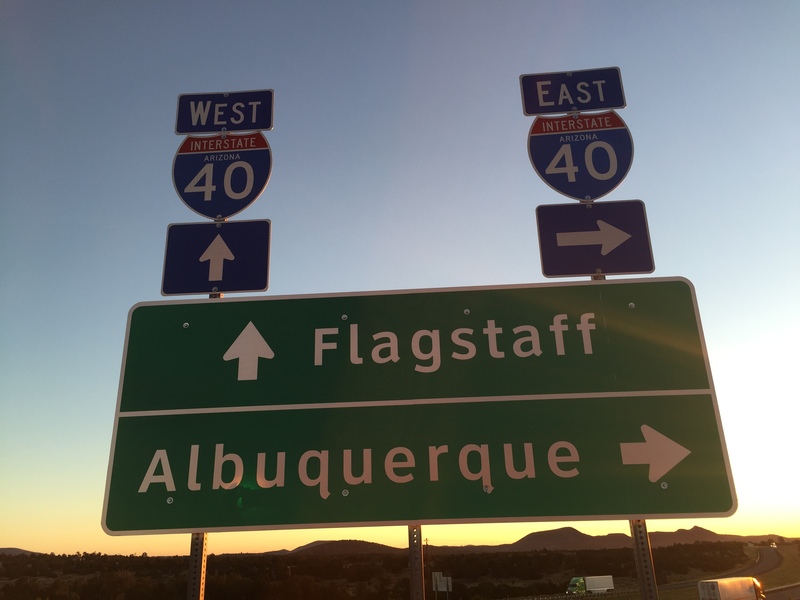 Albuquerque, New Mexico– Long push day to the KOA. Very nice park with level sites, good spacing but very close to the highway. I was able to get a 3.5-mile walk in just within the park by making 3 loops. It was a big RV park! We met a group of French Canadians who where traveling together. One of them had a Heartland Edge, similar to our Ironman Can we just sold. 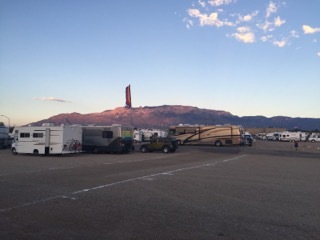 We are hoping to come back here in October for the Xscapers very first Convergence at the Balloon Fiesta. Amarillo, Texas-Oasis RV Resort. This was a really nice RV park as well. Very level and spacious sites with weight room, hot tub and pool. 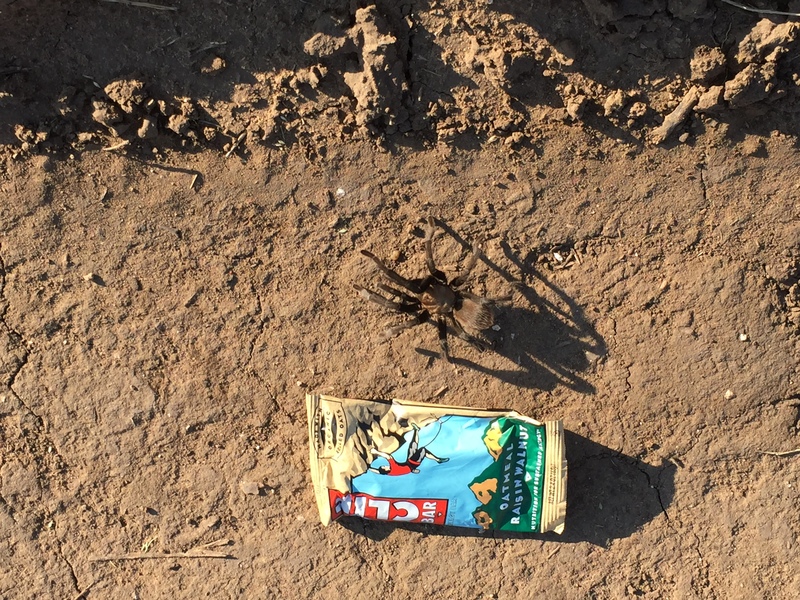 We didn’t use any of the amenities and reviews are mixed on this RV Park as it relates to smell. There are a couple of VERY LARGE cow farms nearby. So the prevailing winds has a directed correlation to the type of experience you will have here. Luckily the temps were cold and the wind was blowing from the North, so we had no issues of smell. 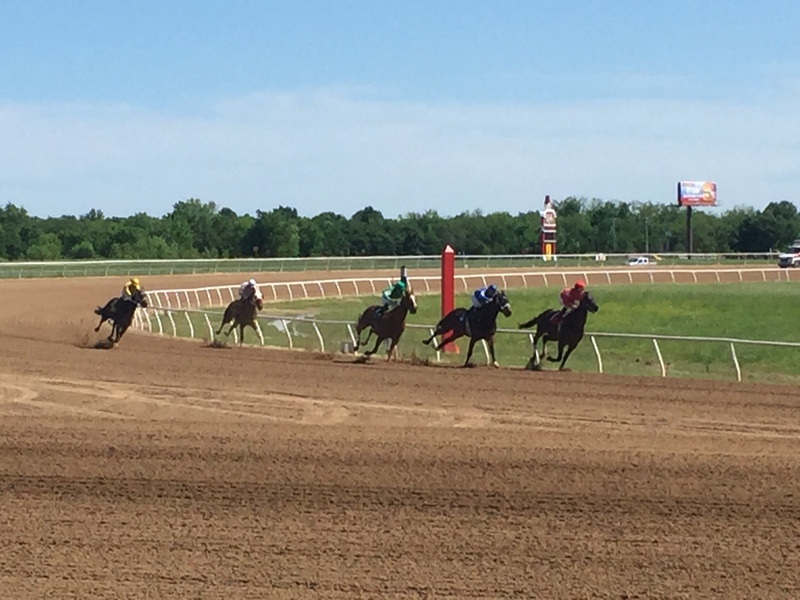 Tulsa, Oklahoma-Long push day to KOA at Will Rogers horse racing track. This is mostly grass covered RV parking. A lot of the sites were flooded with the recent rains, so we were upgraded to a raised gravel site that backed right up to the horse track. We arrived at 4pm so we were able to catch the last 3 horse races. It was entertaining as the horses made their 90-second run (if that) around the track, then a water truck and 3 tractors made their way around grading the course with diligence and speed. Their job took about 15 minutes that was repeated after each 90 second run. We found it quite humorous and had more fun watching the tractors than we did the horses. I know…we are strange that way. We went out for a run the next morning at 6AM to soothing country music over the loud speakers while the horse trainers were already out running the horses. We definitely felt like we were back in our part of the country where people wave as they drive by. If you are from the country you know the wave…one or two fingers just barely lifted off the steering wheel just to give you a friendly hello. Elkhart, Indiana-Long push day to our final destination, MasterTech RV. 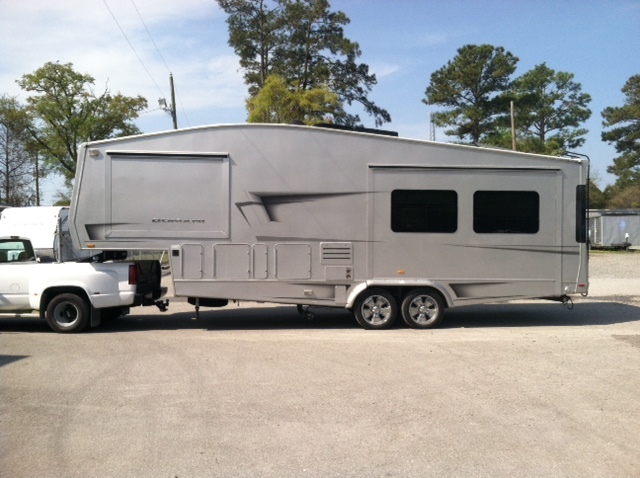 They are doing the work on our personal RV project. The slide on the Dometic RV decided to stop working in Albuquerque so MasterTech is going to work on it for us. And they provide free parking with electric hookups. It’s been a long trip with a few memorable moments. Now that we are here in Elkhart we get to check on the progress on our personal RV project over the weekend. The water damage on our roof was much more extensive than we originally thought…but everything is fixable. More on our project in the next post. Until then…get out and play! 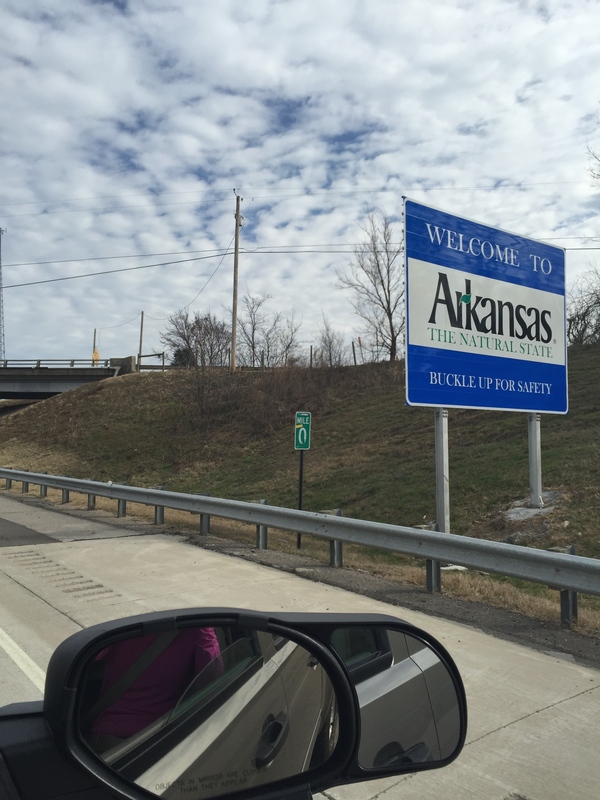 We made our way back to Arkansas for a quick stop over. After mid west temps in the teens we are giddy with the idea of finishing our winter in sun kissed Florida and the desert bliss of Arizona. Despite a week of cold temps this has been one of most enjoyable winters ever! 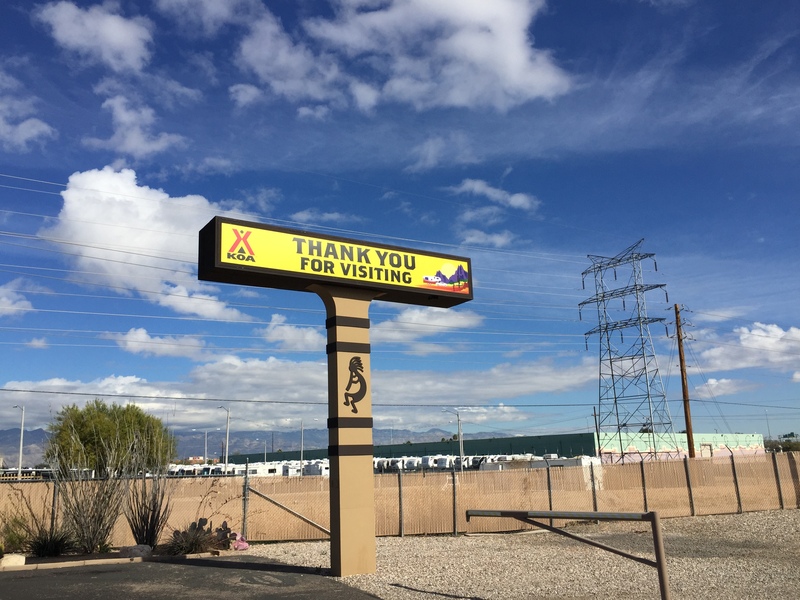 Our fast track from Quartzsite to Arkansas was a trip back to the land of trees with market stops (part of the job) at KOA’s along the way. Jeff and I are partial to wide open spaces and prefer camping in boondock obscurity. But when we are on a mission to get to one destination to another in lightening speed (over 2000 miles in 5 days) we usually do quick overnights at KOA’s. KOA has had a bad wrap for a lot of years due to run down, cramped accommodations. Yet the organization is making a valiant effort to improve their image/brand. They have a ways to go, but two of our four stops were impressive enough to see that the brand renewal is gaining some traction. Our first stop was the Tucson/Lazydays KOA. What a fabulous RV park! Clean spacious sites, an event center, pool & spa and sparkling laundry room. And even more thrilling was that Airstream was having their AlumaFiesta onsite while we were there. A couple hundred shiny bullets both new & vintage were a sight to behold. And since Lazydays RV had their ribbon cutting of their new Airstream showroom and gift shop, shopping for key chains, coffee mugs and 2015 models fresh off the runway were available for purchase. Airstreamers are a loyal bunch. We were surprised by the number of folks who trade up or down frequently all the while never straying from their beloved brand. I have to confess that we have heard from non-airstreamers that Airstream owners are clickish and a particular engineer type (don’t shoot the messenger…my dad was an engineer), but our experience in the desert of Borego Springs and at this event proved that they couldn’t be a more welcoming and warm bunch…just like the rest of us RV’ers. We rolled down the road to KOA’s in Lordsburg, NM, then to Abilene,Tx where the accommodations were of the typical old school setup. Abilene being the nicer of the two. Then again, we drove 10 hours that day. A moldy foam cushion under a bridge would have sounded heavenly! 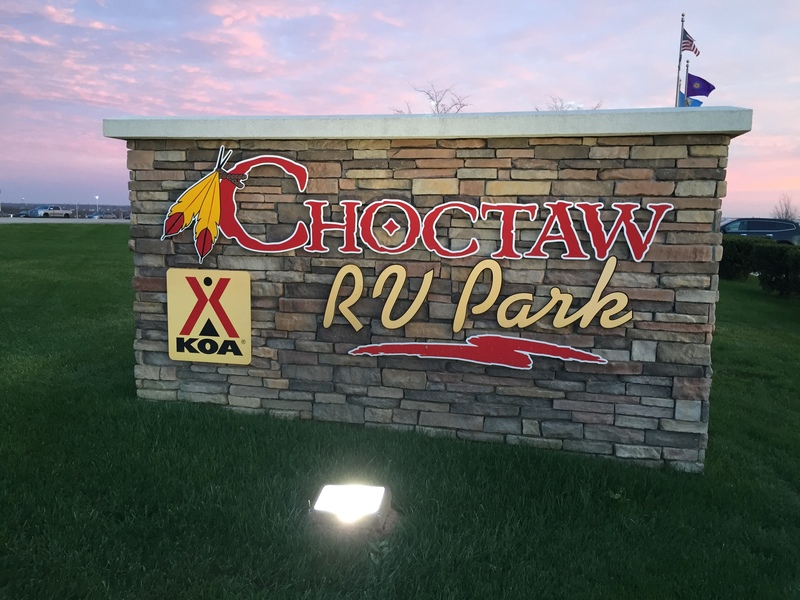 Our last stop was in Durant, Oklahoma at the Choctaw Casino/KOA about 1 1/2 hour north of Dallas. This KOA is owned by the Choctaw Indian Reservation with an associated Casino. It’s a newer campground with event center, pool, laundry AND the most beautiful bathrooms/shower facility we have ever seen. Charlie and his wife manage the place as if it were their own. They know their business and pride themselves on cleanliness and upkeep. The grounds are laid out around a pond with each site being nicely spaced, level, paved with a bit of separation by hedges on each site. They even have round covered picnic tables for each RV. 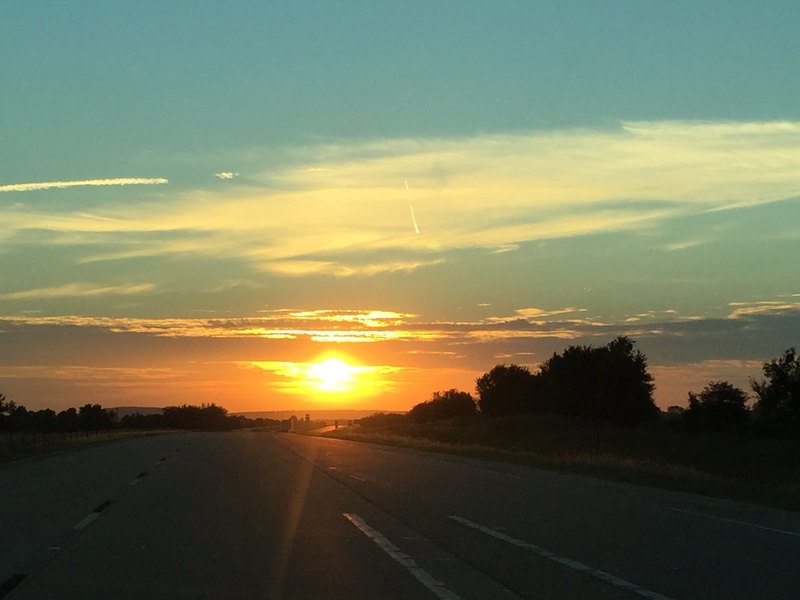 It’s hard to imagine that Durant OK would be a destination in such a small town, but with the Casino offering free shuttle pick up right from your site and big buffets we could see this place being a nice weekend get-a-way or for stay-cations. As I type this I am flying to Tampa where I will meet up with Jeff for a sales conference before picking up a Class C show vehicle. We are transporting “Ms. Piggy” to Phoenix for the Good Sams Rally in two weeks and then to Tucson for the Escapees Escapade in March. If you are in the area stop by and look us up! We love to meet you and hear your RV story. It’s New Years Day here in Borrego Springs, CA and we woke to spectacular scene in the desert…SNOW! What a beautiful sight to help summarize a beautiful year. Some special kids learning english. 20 years with this guy! Roasting marshmallows on an active volcano. March we headed off to Guatemala for 3 weeks on a service trip. We visited some remarkable teens trying to improve their lives by learning English…their ticket out of poverty. Even with so little, even with so much daily effort to live day-to-day, they persevere and overcome obstacles just so they can get an education. Their montra…”It is difficult but not impossible”. One of those students, Miguel, was chosen for a Walton International Scholarship to John Brown University in NW Arkansas…his dream! And one more highlight from our trip. Roasting marshmallows on an active volcano! Mom is now an official Arkansan…she got the T-shirt. Spring and early summer brought lots of triathlon, ½ marathons and trail runs. May Jeff made a last-minute trip to Red Bluff CA to help his Mom move out of her home after it sold. Finding out she could no longer live alone, the family made the decision to move her to Arkansas in August. This ended up being a great move and his Mom is very happy to be near 3 of her 5 kids. July we headed off in our camper for RAGRAI for our second year. This is a week-long bike ride across the state of Iowa. This trip kicked off a 2 month road trip that took us from Iowa to Louisville, KY, Salt Lake City, Redmond OR, Henry IL, Hershey PA, Elkhart IN and back to Louisville. The highlight of the trip was camping in the Black Hills of S. Dakota and seeing Mount Rushmore. Back home in September for two weeks we reloaded and left for an EPIC adventure to hike the Grand Canyon rim to rim (Deb) and rim to rim to rim (Jeff) in October. 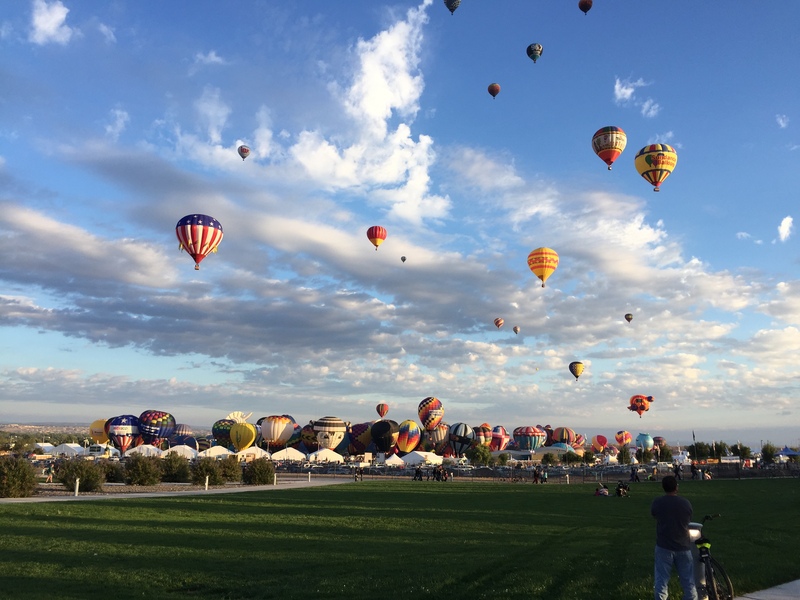 But not before we stopped over at the magical Albuquerque Balloon Fiesta. We crossed off two bucket list items on this trip. 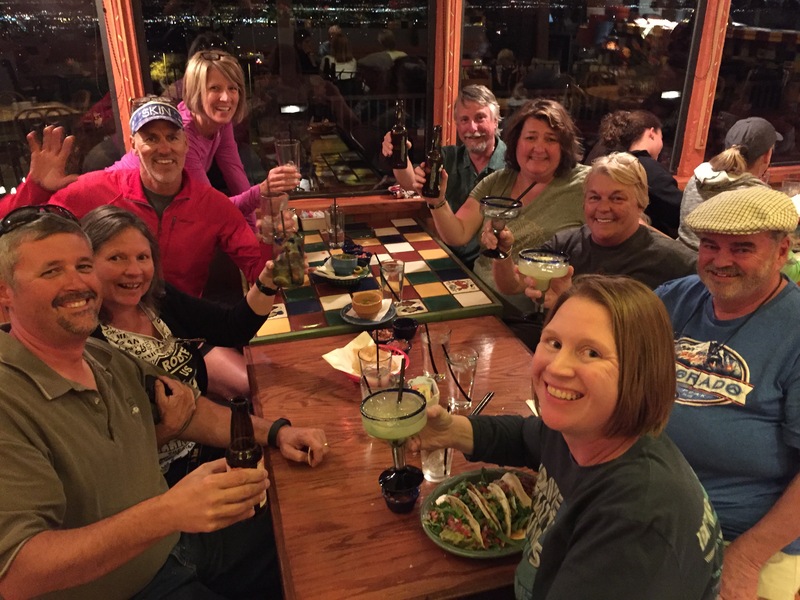 We boondocked in Flagstaff before and after the Epic GC hike for some high altitude training before heading into Sedona for spectacular red rock scenery, hiking and a hot air balloon invasion. Those Canadians sure know how to make a grand entrance! After Sedona we headed down to Tempe AZ where we driveway camped leading up to the Arizona Ironman competition. Jeff did a great job in the competition and finished under 12 hours. I on the other hand (besides being an Ironsherpa )surfed the net, took naps and ate ice cream during that 12 hour period. Spectating is tough stuff people! 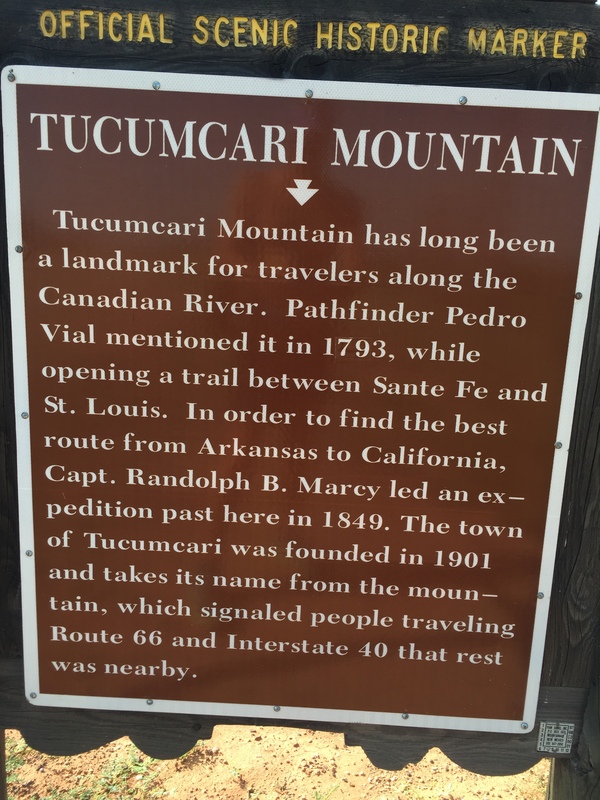 After Ironman was a trip back to Arkansas for business and plans to head to our next destination….Yuma AZ. Yuma is a mecca for Snow Birds with over 32,000 RV sites. 80% of those are filled with Canadians who stay for 5-6 months out of the year. We crossed over the border into Mexico for a few hours. Just long enough to check out the vibrant pharmaceutical & dental scene (300+ Dental offices) and have lunch. If you are looking for cheap implants, crowns, cleanings or Viagra this is the place to go! We headed north from there with a brief stop over in Quartzsite before coming to a stop in Lake Havasu City AZ for the lighted boat Christmas parade. 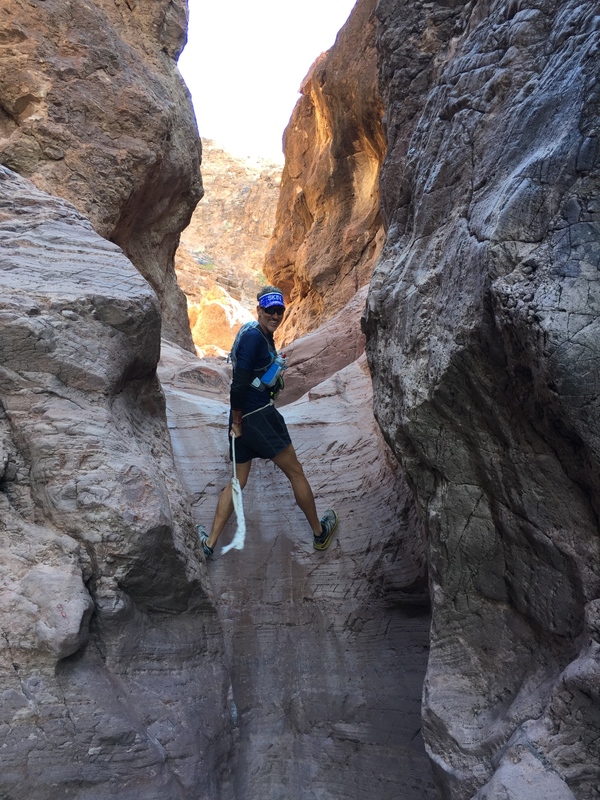 We boondocked in a couple of different locations and hiked our first slot canyons. December we moseyed over to Desert Hot Springs RV Family Spa and lazed around the mineral spas until we were completed pickled and hiked the Thousand Palm Oasis. 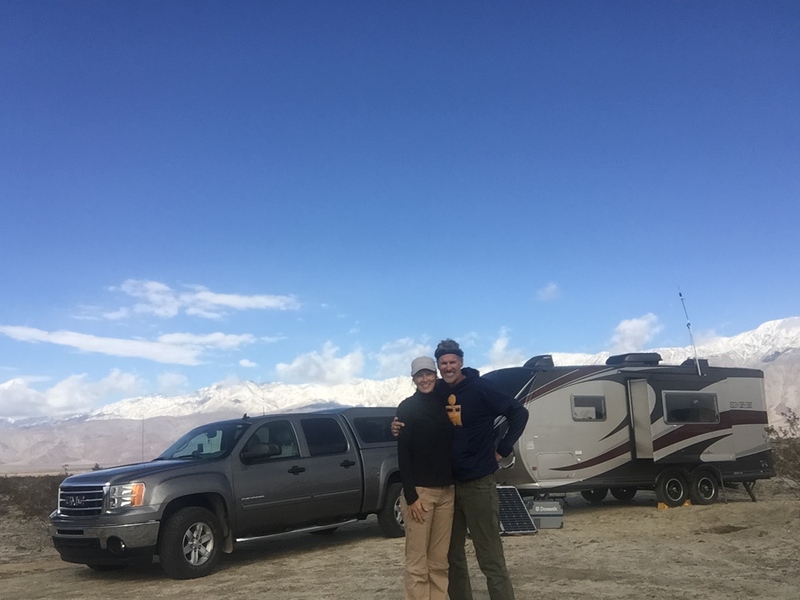 We met up with some full time RV bloggers and online mentors. After a week of spas we headed down to Borrego Springs CA to celebrate Christmas and New Years in the fabulous desert and hooked up with friends Stephen and Denise. We met them last year while camping in Colorado. They taught us how to play pickle ball, invited us to their RV park potluck for Christmas AND had us over to watch the Razorbacks take down Texas in the Texas Bowl. Go hawgs! 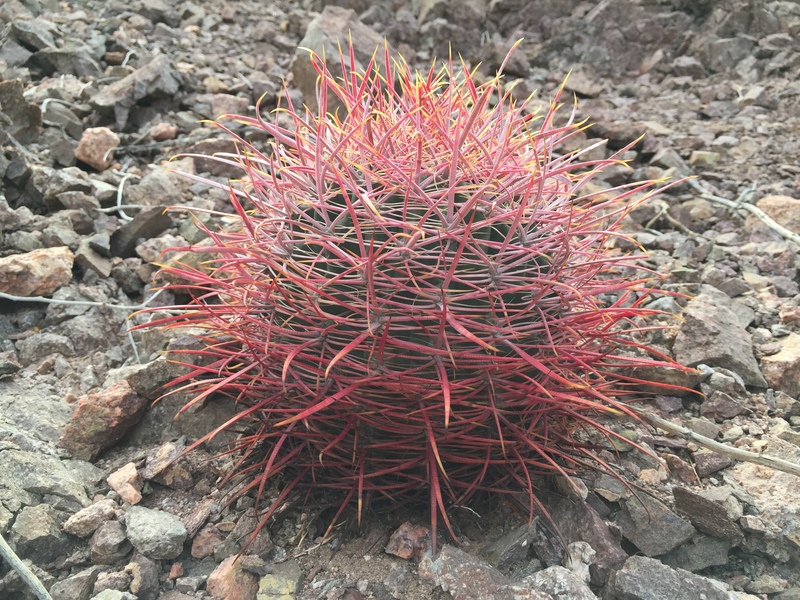 Closest thing to a Christmas tree in the desert. It is hard to imagine that we have done so much when the year has flown by so fast. We already have some plans made through March 2015 and we hope that you come along for the ride. Our next destination? The big Quartzsite RV and rock show in January. Stay tuned!